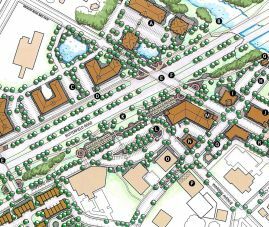 The Old Town/Civic Center Subarea Plan was adopted by the City on April 16, 2007, as a component of the City of Warrenville long range Comprehensive Plan. The Old Town/Civic Center Subarea encompasses approximately 320 acres of land in the original center and most historical area of the community and includes the area near the Warrenville Road/DuPage River Bridge and the area located around the Batavia Road/Butterfield Road intersection. This plan is one of the most important “tools” the City will reference when making decisions related to land use, development proposals, and City investment in the subarea. The Subarea Plan provides written and graphic policy direction on what specific public/infrastructure improvements are desired and what type of development/ redevelopment is appropriate in this area of the City based on community input, real estate market dynamics, and economic feasibility considerations. The Subarea Plan includes detailed discussion on what actions the City of Warrenville may take in order to implement the approved plan and achieve the goals and objectives it articulates. Paper copies of the Old Town/Civic Center Subarea Plan are available for review at the City of Warrenville Community Development Department.